Honor the hard work of your senior players and their parents' support with everlasting roses made from genuine football material. They have worked so hard on the field and in the classroom to make it to this point. Each year, schools across the country honor their graduating seniors during Senior Night ceremonies on their last home game. 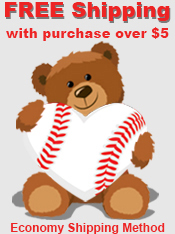 In many school traditions, players will give a live rose to their moms during the ceremony. It's an emotional event for players and their families and gives an opportunity for everyone to recognize and say goodbye to players moving on in their careers. 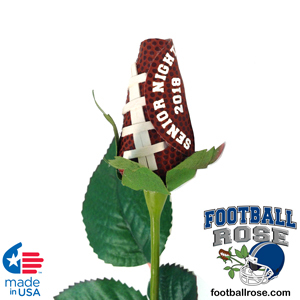 The Football Rose offers a memorable way to honor this special occasion. We carefully create each Football Rose by hand using real football material to form petals on an unforgettable bloom that lasts a lifetime. 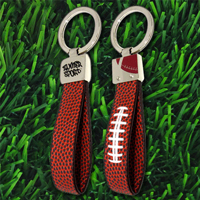 We add the finishing touch to the Football Rose by hand-stitching genuine leather laces on one side of the rose. 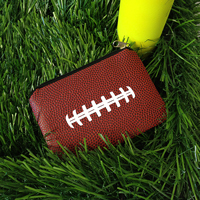 The Football Rose will never die, just like the passion any football fan has for their favorite sport. 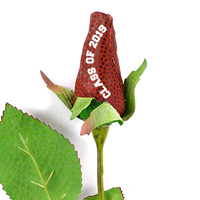 The special edition Senior Night 2019 Football Rose includes a message imprinted on a petal that reads, "Senior Night 2019". We can also add player number personalization on the Football Rose for an additional charge. Custom Petal Message: "Senior Night 2019" printed using Athletic-style font in White print. 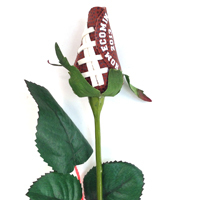 2nd Petal Personalization: We can also personalize a 2nd petal on your Football Rose with a player name, number, or special message (up to 15 characters) using an Athletic-style font. From Suellen Kurt of DeForest, Wisconsin on 10/20/2015 . My Seniors were so thrilled with this keepsake!! From Brenda MacCartney of Chicago, Illinois on 9/16/2015 . From Shelly Smith of Kewanee, Illinois on 10/9/2013 . Great idea! They were quite the hit for my daughter's boyfriend and his family. His Grandmas . . .
From Janice Green of Northport, Alabama on 10/7/2013 . Love It!!! I would give it 6 stars if I could. Keep up the good work. 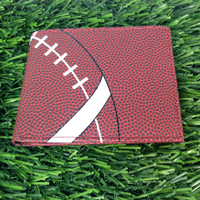 Show your [heart] for the game by sporting a football hearts pin on your shirt, purse, back back, or jersey. Share some pins with your friends/family.